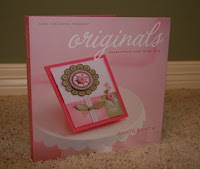 Crafty Happiness: New Fun Stuff! I'm with ya sister!! I got my shipments too, and just couldn't wait to fill up my little craft jars. I actually ended up taking the foam OUT of the ribbon rounds CTMH carrier, MUCH better, I can put the organdy and all kinds of ribbon in there! And the book, forggetaboutit!! Fabulous!! Love Ya! !